Pours a bright golden straw/hay color with a fizzy white head that evaporates off rather fast and leaves no trace on the glass. Smells like I’m standing in a field of strawberries which is next to a field of wheat. The smell reminds me of summer. There isn’t an overpowering flavor going on, which isn’t a bad thing. The flavor that is present is like a Strawberry/vanilla smoothie with a wheat grass zinger. This is why I say I’m glad it’s not too strong, too much of that flavor in a beer would be bad. 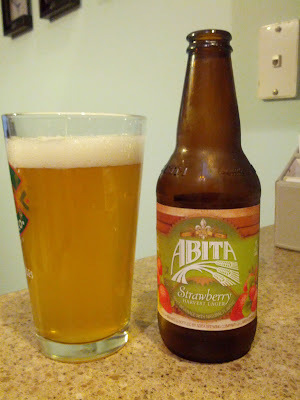 However there is just enough of this flavor to make it nice… if you’re into fruit beers. The mouth feel is light and bubbly with bountiful amounts of carbonation bouncing around. I had one of these over the holiday weekend while roasting in the sun and it was incredibly refreshing. Outside of a hot summer day I don’t really see myself drinking this as I’m not into the fruit thing. Overall I’ll give it a 3/5 rating and hope to have one or two more next year.